I LURV this one! But i’m gonna need it in a pink or ghost or something nicer than grey. "Ariel Tank is Back!!! In PINK!!" "Scoop From Down Unda! Currant and Persian Purple"
FLEEEEEEEECE!!! YayYayYay!!!!!! I knew there was a reason why I've been saving my money 🙂 I agree, I'm going to hold out for another color…I have last year's version in Coal. Holli, Does it run TTS? Mine from last year was TTS. This one doesn't seem to be as fitted as last years version. oh what's that thing on the back between the shoulders, looks a little big for the lulu logo…. 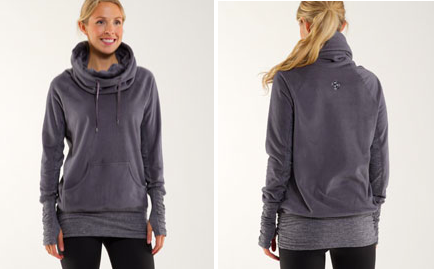 I loooove my Post Run Pullover, so I'm really excited for this one! Can't wait to see it in Ghost and some colours.. I have 2 post run pullovers and now I need this one too!! Seriously–I want ghost but I will take it in any color possible! Ohhh I want this in both Ghost and Black!! Can I justify this even if I already have Scubas in both colours?! Definitely have to have this in any color I can get my hands on. So glad I've been saving my money. I like wrists and length of it. BUT I do not like the global look. Not for me! I keep my money!!! OMG!!! I hope this comes in Black Swan! First time I've been excited about something from Lulu in a long time. The neck opening looks huge! I bet Lulu raised the price on this too! I wish they get back to colour options instead of grey,black too boring and uniform looking. Was at Lulu today looking for this and I noticed wunder under crops have gone up $10. The crops were stickered at $78 and when I checked the website they're still listed as $68. I'm not impressed Lululemon. You are making an insane amount of money. Do you really need to start making things more expensive? So far CRBs, define jackets, scubas, wunder under crops…soon I will nto be able to afford yoU! Saw the fleece tonight in an Ontario store. It has a fake fur lining! The logo is done in gradient threads so it's grey and white and it's $98. They only had the grey one out. It's heavy with the lining. Also all still shorts on sale for $44 including black! Yeah! They were regular non reversible wunder unders crops and were stickered to $78 so the price must be going up soon.